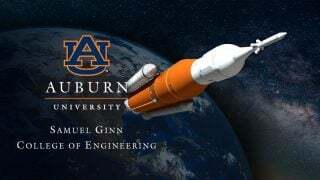 James Spann has the Alabama forecast moving toward midweek from Alabama NewsCenter on Vimeo. As you can see, the heavier rain totals were over central and east Alabama, with big downpours that developed yesterday afternoon and early last night. We have more showers forming on radar early this morning, and we will maintain a good chance of occasional showers and thunderstorms statewide today. The sky will be mostly cloudy, and the high will be in the mid 80s for most communities. 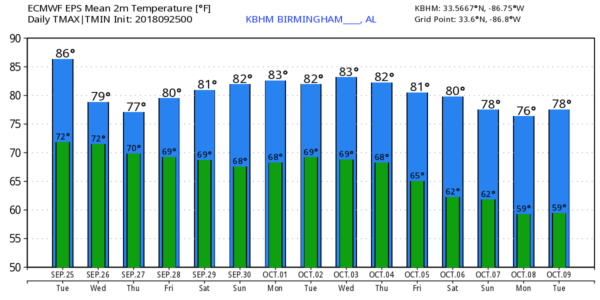 The average high for Sept. 25 at Birmingham is 82. MIDWEEK: A deep upper trough will dig down into the central U.S. over the next few days, pushing a cold front in our direction. This will keep our weather wet through tomorrow and Wednesday with periods of rain and a few thunderstorms. Additional rain amounts of 2 to 3 inches are likely over the northern half of the state. Like yesterday, a few strong storms are possible, but organized severe weather is not expected. The front will stall out just north of Birmingham Thursday; drier and cooler air will ease into the northwest corner of the state, but wet weather continues along and south of the front. FRIDAY AND THE WEEKEND: Last week the European and American global models showed the upper trough setting up over the eastern third of the nation Friday, pulling down cooler and drier air. Now the models have backed off on the idea; instead they lift the trough out rather quickly, meaning the front most likely won’t get past Birmingham. So rather humid weather will continue Friday through the weekend with a mix of sun and clouds, and scattered showers and thunderstorms daily. The chance of any one community seeing rain each day will be in the 40-50 percent range, and most of the showers will come from 1 until 11 p.m. Afternoon highs will be in the mid 80s, a little above average for the end of September. NEXT WEEK: No real change for the first half of the week, but the next long-wave upper trough could bring a shot of cooler, drier air toward the end of the week. 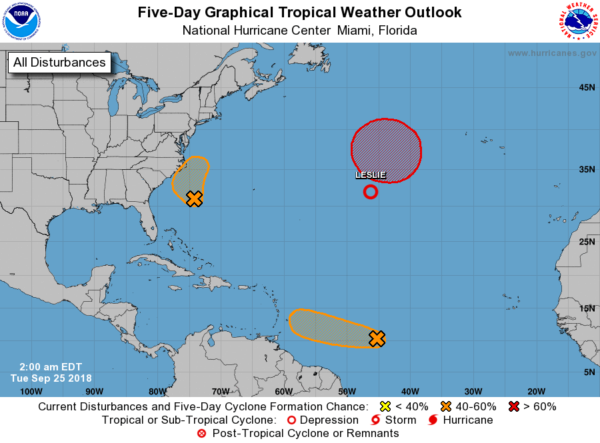 TROPICS: A wave, formerly Tropical Storm Kirk, could regenerate as it approaches the Windward Islands over the next day or so, but it will dissipate again over the Caribbean this weekend because of strong shear. A wave will skirt the Outer Banks of North Carolina tomorrow; this is the “ghost of Florence.” And a system formerly known as Leslie will stay in the middle of the Atlantic, no threat to land. Nothing is threatening the Gulf of Mexico anytime soon.